On August 25, the Arakan Rohingya Salvation Army (ARSA) — formally known as the Harakah al-Yaqin — coordinated an attack on a Burmese army base and 30 police posts in the state of Rakhine, killing more than 71 people, including 12 security officers. Calling the ARSA “extremist Bengali terrorists,” the Myanmar army’s response was swift and brutal, and within two weeks, 123,000 Rohingyas fled their homes. Dubbing their response as clearance operations, the army burned villages and even planted landmines as a way to further target the fleeing Rohingyas. But the army’s response is grossly disproportional. The ARSA is a small group with no links to transnational terrorist groups (yet) and has a very narrow mission: stop persecution of Rohingyas Muslims. Because of the actions of this minor group, there are currently half a million refugees in Bangladesh seeking security, protection, and food in makeshift camps, where they are exposed to the elements and increasingly vulnerable to disease.While the United Nations declared the persecution and recent flight of the Rohingyas “a textbook example of ethnic cleansing,” the region has a long history of discriminating against them. The clash between Buddhists and Bengali-speaking Muslims in the in Myanmar’s Rakhine province can be traced back to the 1980s when the Burmese regime abruptly stripped them of citizenship. 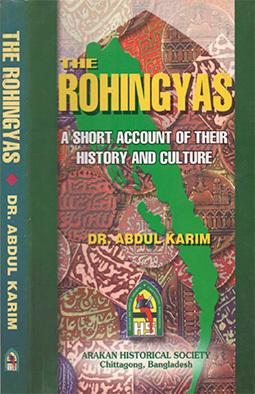 While the Rohingyas, who are predominantly Sunni Muslims, claim to be indigenous to the area, the government of Myanmar has always viewed them as illegal immigrants from neighboring Bangladesh. 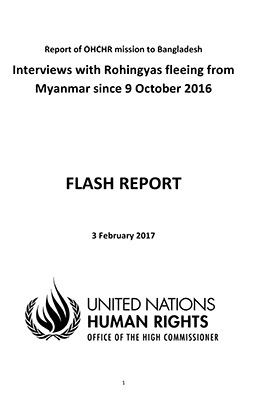 The government further maintains that it will reinstate their citizenship rights if they drop the term “Rohingya” and instead register as “Bengalis.” This condition is unacceptable to the Rohingyas, who are protective of this label as it has become a part of their identity, and the means why which they can garner international attention. Myanmar’s refusal to acknowledge Rohingyas as an ethnic minority entitled to citizenship rights is not just semantics. It is related its territory and sovereignty. According to the state’s 1982 citizenship law, if the government accepts the Rohingyas as a legitimate Burmese ethnicity, they will have autonomy in Rakhine, where they are the majority. Myanmar, a predominantly Buddhist country, fears three potential developments: 1) an alliance between the Rohingyas and Bengalis, both of whom are Muslim, 2) calls for secession that may follow an alliance, and 3) the ARSA entrenchment in Rakhine. To be fair, Myanmar’s fears may be overstated but they are not misplaced. As a weak postcolonial state, it is suffering from a myriad of issues, such as civil–military imbalances, corruption, poverty, and food insecurity. But persecuting the Rohingyas is a short-sighted strategy that threatens Myanmar’s credibility — and, by igniting dangerous religious and ethnic fissures, the security of the region. The genocide-like persecution of the Rohingyas continues to put Bangladesh in a strenuous geostrategic position. While Bangladesh has welcomed the refugees, it is also a poor country with limited resources. 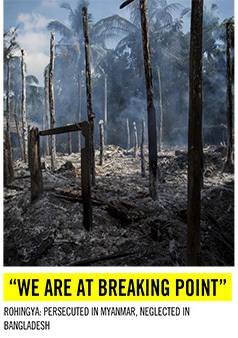 And similar to Myanmar, it also has a checkered past with the Rohingyas. Earlier this year, Bangladesh wanted to hold talks with Myanmar to accelerate the process of resettlement, where one official said, “We want to see them leave Bangladesh quickly.” Currently Bangladesh’s government is working to relocate the new refugees to an “unlivable island” to decrease some of the pressure that the influx has caused. On closer examination of Bangladesh’s domestic politics, the Hasina administration’s reaction to the refugees is a balancing act between criticizing Myanmar, pacifying Bengali right-wing Islamists, satisfying Bangladesh’s army, and appeasing India, who has also persecuted the Rohingyas in the name of national security. The ongoing crisis, however, highlights two important developments that will negatively impact the fate of the Rohingyas. First, the ARSA, currently an outlier, will be linked to the larger Rohingya community, increasing its prominence, and potentially emboldening it. While the ARSA has links to both Saudi Arabia and Pakistan, there is no evidence that the group has links to al Qaeda and the Islamic State (ISIS) or that it has been incorporated into larger transnational Islamist extremist networks. It is a small group whose main grievance — persecution of Rohingya Muslims — can be solved relatively easily by ending widespread discrimination. While meeting ARSA’s demands of citizenship and political equality will expose Myanmar’s poor governance, especially in the Rakhine province, it will likely eliminate the main root of violence in the area. But if the situation continues as is, ARSA might grow and develop real links to real terrorist groups, a claim already being made by Myanmar, India, and Bangladesh. Second, and more troubling, the Rohingyas are set to become a regional political tool that will continue to be used to justify a series of predatory and illiberal counterterrorism strategies as seen, again, in Myanmar, Bangladesh, and India. As yet another boat full of refugees — mainly children — capsizes and survivors share stories of sexual violence, the current state of Rohingya suffering seems to have entered a new, more horrific chapter. Worldwide protests may pressure the current government in Myanmar to end the violence and accept the Rohingyas back, but it will not end the practice of linking a persecuted community to terrorism. Sahar Khan is a visiting fellow at the Cato Institute.